One of our goals with Bike Friendly Richardson is to get more people to ride their bikes when making short trips around town. We also believe in supporting the Richardson retail community and we’d like to see more residents choosing local businesses, like yours, when making purchases. To help promote that, we are asking local businesses to offer some type of discount to anybody who rides a bicycle to your location. In return, your business will be recognized as a Partner of Bike Friendly Richardson. As a Partner, we will promote your business on our web site, Facebook, Twitter and throughout the Richardson bike community. Would you like to be a Bike Friendly Richardson Partner? STEP 1 – Contact us at bikefriendlyrichardson@gmail.com or by phone 972.836.6131. STEP 2 – Tell us what discount, deal or special (big or small) that you would like to offer local bicyclists when they arrive by bike to your location. – This is a great way to bring more customers to your business. – You are promoting healthy living within our city. 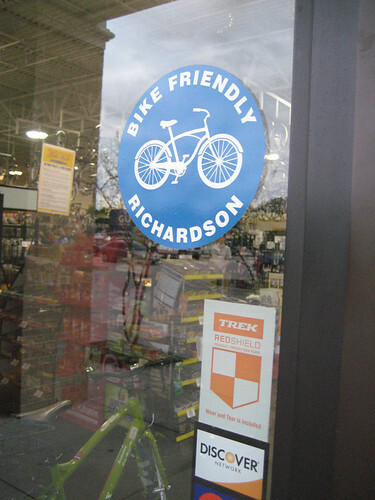 – You will get a Bike Friendly Richardson decal for your door to show your support. People will start to recognize these and hopefully choose you first. – It’s absolutely FREE. Bike Friendly Richardson does not charge you for this service. Our goal is to connect local business to the Richardson bike community. To become a partner, simply contact us by email at bikefriendlyrichardson@gmail.com or by phone 972.836.6131 so we can work together to connect you with Richardson cyclists.